For me, there are very few things in this world that can compete with experience of listening to good live music. Something about watching a person, band or group pour their entire selves into what they love, to produce sound, to make music is extremely good times, potato salad. If the artist or group, messes with time signatures, masters the tight formations of start and stops, involves dramatic crescendo’s to great high’s, decrescendo’s to soulful lows, is filled with rich harmony and jaw dropping vocals I’ll be hooked. While biology tells me I hear via the eardrums, I know the music really enters my body through the fingertips, and travels up the tendons like a superhighway to the brain. While it’s on its way, the music seeps into the bone marrow… depositing little hits of musical morphine along the way. It may sound abstract. A tad odd, maybe even corny, but this is what listening to good live music does. There is one goal for this blog: I am going to write a post about every song within the Sara Bareilles discography. This will include studio albums and those occasional non-album tracks that find themselves in various film soundtracks or compilations. I am not a writer, or a critic. I am however, a fan with apparently too much free time. These are my opinions alone and I’m sure there will be discrepancies with her actual meanings, but the exercise should still be fun and worthwhile. So follow the journey with me. Album by album I will explore themes, structure, and lyrics. I will write about those songs I like and dislike. It may take awhile, or it may come quickly, I’m not really sure. I guess the obvious question is why? Glad you asked. 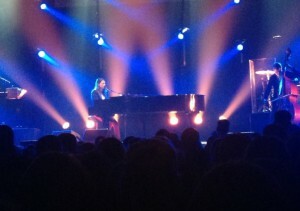 I have been a fan of Sara Bareilles ever since I saw her open for Ben Folds in 2007. It was just her and her piano. At that time, very few knew who she was, and little did we all know that we witnessed someone on the cusp of stardom. Her music made the large venue seem intimate. The giant stage became small, and there was no hiding for her or her listening guests. I met her that night at the “merch” table after she performed. She signed my copy of her album which I still have and I have been hooked ever since. Her music is thoughtful, well crafted and most importantly she seems to have a blast doing what she loves. That passion is infectious and so I’ll try to do my part, and join her in her journey even if from another perspective. Like I said before, I am not a writer by trade. Although, I don’t mean to brag, but I did take a few literary courses in college, sooooo, that kinda makes me an expert. So indulge me, as I will try to put my non-fiction and literary journalism training to good use exploring themes, metaphors, familiar narratives and the social relevance with pop culture within Sara’s songwriting. Take a gander through the passages, listen to her music, take the hit of musical morphine, and survive for another day.